The new mobile fishing huts. An Aberdeenshire estate has unveiled three mobile fishing huts to replace those lost during January’s devastating storms. Glen Tanar in Royal Deeside lost seven traditional fishing huts during Storm Frank and the estate management has decided they need to “evolve” with the river. The new custom-built sheds are fully transportable and have their own solar power supply. Each comes with a wood burning stove and composting toilets. Crucially they require no foundations to be built which means they can be moved to any of their beats on the River Dee. Last night Claire Bruce, Glen Tanar’s sales and marketing director, said: “Following Storm Frank at the beginning of the year we needed to think differently about the River Dee and how it evolves and changes. She added that the new armadillo style huts are not only “eye-catching” but are also sustainable and have a low carbon footprint. The structures were designed by Midlothian-based family firm Armadilla Ltd. 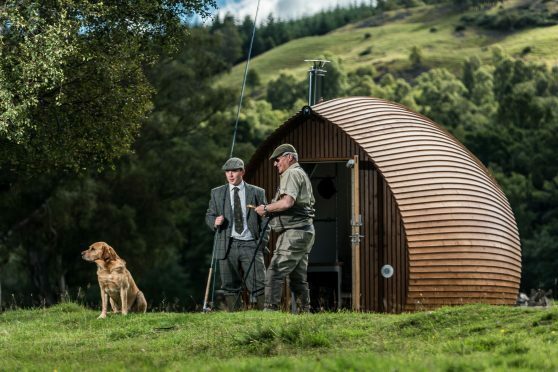 The firm’s Ross Hunter said: “It is ideal for use as a fishing hut and this is a first for us to custom build three for use on the River Dee. The storms and flooding which ravaged Aberdeenshire at the beginning of this year washed away many of Glen Tanar’s fishing huts and tracks. Everything has now been repaired and replaced, and the estate team believe salmon catches have actually improved on last year. On Tuesday the Queen visited Ballater, one of the areas worst affected by the storms, and met with locals who are rebuilding their homes and businesses.